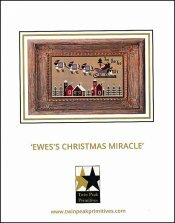 Ewes's Christmas Miracle' [H6287] - $13.00 : Yarn Tree, Your wholesale source for cross stitch supplies. Cross stitch pattern by Twin Peak Primitives. Here comes Santa Claus...oh wait those aren't deer, those are sheep! With their Santa hats on & their warm blankets draped over their backs, they are helping Santa deliver his gifts this year. Snow decorates the rooftops while large Christmas wreaths decorate the front of the barns at the farm. It's a snow white Christmas at the farm! Stitch count is 125W x 64H.